As a garden coach, I’m often asked if there are any organic ways of getting rid of weeds that actually work. Nobody wants to spray harmful chemicals in their garden. The good news is that there are a lot of organic alternatives. The bad news is, some organic techniques can require an up-front time investment, and organic weed sprays can be pricier than chemical sprays. Still, if you have children or pets, like to walk around barefoot, or simply want to be a good steward of the earth, it’s worth a little extra effort to take care of the weeds in a sustainable way. Weeding by hand In garden beds where there are plants you like growing close-by, pulling weeds by hand is simply the best method of control. You don’t need to worry about herbicide drift (even organic herbicide drift) hitting your desirable plants, or making your soil inhospitable as with chemical weed sprays. Also? There’re no dead weeds left behind. Any other method, you still need to come back and pull the dead weed out, or be patient and wait for it to break down and disappear on its own, which can take between a week and a year depending on how sturdy the weed was. With a single great tool like the Hori-Hori or Japanese Soil Knife (I love the lightweight stainless steel version), you can get dandelions’ long taproots with the same tool you use for other weeds. If you don’t wish to bend, you can use a long-handled scuffle/ hula hoe, or a diamond hoe. These types of hoe work by either dislodging baby weeds so that their roots are exposed and they bake in the summer sunshine, or by separating the young weeds’ foliage from the roots so that the plant can’t photosynthesize. It doesn’t kill everything on the first try, but works pretty well if you do it regularly and catch them when they’re tiny. There are an increasing number of effective organic herbicides on the market, and most of them work by burning off the waxy cuticle that protects the plants’ cells from losing water. This means you see nearly immediate results. The nice thing about organic herbicides is that they only kill things that get their foliage coated with it, so if you have bulbs underground, or tree roots nearby, you’re still safe, unlike with some traditional chemical herbicides. The bad thing is that if you aren’t careful, it’s easy to spray your prized perennials with it, too. This is true for chemical herbicides as well. You can avoid this by spraying in the morning before the wind acts up, and by using a cardboard tube or paper cup with a hole cut in the bottom. Simply set your spray nozzle in the hole in the bottom of the cup, set the rim of the cup over your weed, and spray! All the drift hits the inside of your cup. I’ve found WeedPharm extremely effective in my own tests. It’s the only food-grade herbicide currently on the market. It’s 20% acetic acid (as opposed to the 5% acetic acid in household vinegar), and it works the same way as the other organic herbicide sprays – by burning the waxy cuticle off above-ground portions of the plant. It can also be injected into the taproots of dandelions or the base of the plant using a syringe (the manufacturer recommends a 40cc syringe without a needle, like you’d use to give your cat liquid medicines). The best thing about this method is that you can kill dandelions fully in any weather (all weed sprays, organic or not, need temperatures of 60 degrees and dry weather to work their best – but this method is effective even in the winter rain), and you can kill dandelions even if they’re coming up in the center of other plants or in your lawn. I have heard a warning that vinegar and acetic acid may stain concrete and some kinds of stone, so if you are concerned, do a spot-test before spraying WeedPharm around patios and flagstone pathways. You will need to hit woody weeds multiple times, and start hitting woody weeds when they’re young in order to have success with it. It works on non-woody weeds like dandelions, too. It’s made of 20% citric acid and contains super-concentrated vinegar, and like Weed Pharm, works by burning off the waxy cuticle that protects plants’ leaves. Remember to spot-test on stones or concrete before using, as I said before! Normal vinegar has a 5% acetic acid concentration, which isn’t high enough to kill sturdy, mature weeds, but which will kill the baby sproutlets coming up in your empty veggie bed. You may need to apply vinegar twice to kill all the sprouts, but within 24 hours of your last spray, it will have broken down into the soil and should be safe to plant. 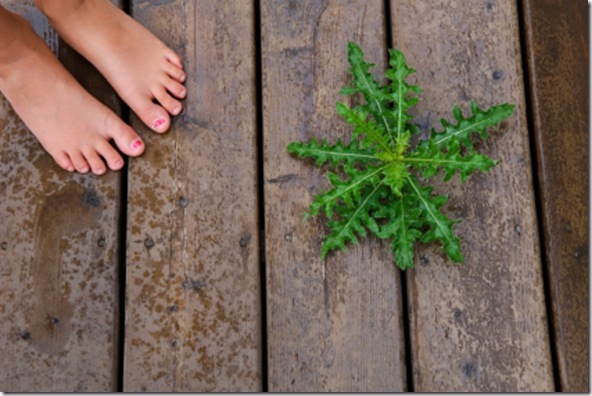 Sidewalk cracks, gravel driveways, and stone or brick pathways can be hard to remove weeds from, since the weeds toughen up quickly and we can’t reach their roots. It’s nice to have a few stronger options for areas where we aren’t trying to grow anything. If you end up with a lot of dead weed foliage after treatment, try running your string trimmer/ weed eater along the weed tops so you can sweep them up. Weed torches are an awesome organic solution. Like organic herbicides, they work by damaging the waxy cuticle that protects the cells in plants’ leaves. It isn’t immediate, and you may need to torch weeds a few times before they give up the ghost, but it works well without introducing any chemicals into your garden. One caveat – weed torches will kill the beneficial soil micro-organisms that help your plants thrive, so while I love using a weed torch in areas like a gravel driveway or in cracks in concrete, it’s not a great solution in areas where you wish to plant. The heat from a torch can damage desirable plants nearby, so this also isn’t something to use near your favored plants (stayat least 5 feet away!). I do love that you can use a weed torch while standing up. My knees don’t really approve of kneeling on hard concrete to weed in the cracks, even with a kneeling pad. Yeah, boiling water to kill weeds is totally inefficient – but if you have an area of weeds right outside your kitchen door, why not dump your leftover boiling water on the weeds in between the sidewalk cracks? It works almost as well as the organic herbicides and makes more sense than dumping the water down the drain! This will kill your beneficial soil organisms, though, so don’t do it where you’re actually trying to grow things. This is a rough solution, but multiple trusted sources have suggested mixing 4 cups of household vinegar with 1 cup of salt, then adding half a teaspoon of liquid soap to help the solution stick to plants. While it sure sounds as though it would work, I’m not entirely sure how to apply it – would a solution like this go through a sprayer smoothly? You definitely don’t want this anywhere near your planting beds or lawn, but on the sidewalk I think it’d be fine (spot test first!). If you try it, let me know how it works. 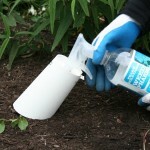 There are new products and techniques being honed all the time for taking care of weeds. Have you tried any organic products that worked (or ones that were a waste of money)? Let me know how you get rid of weeds in the comments below! I like the first method of manual removal. I use a, um, erm, I guess I don’t even know what it’s called; I think weeder (the long narrow blade with a forked end). In fact, I use that for a million things. Sometimes I even use a trowel to weed. I’ve heard of the hori-hori but not seen it… think I may invest in it because it seems to combine the pointed sharpness of the weeder with the nice leverage of the wider blade of the trowel. Plus, it just looks serious, you know?! Also, I love the idea of weed torches because fire is just good, but I’ve not used them, either. When I have had to use Roundup (for poison ivy and buckthorn) I either paint it on with a sponge edging tool or, if spraying, I make a shield out of an opened cardboard bov to protect nearby plants. Monica’s last blog post..Hooray Spring! There are numerous studies showing Roundup to be incredibly unsafe (carcinogenic, mutagenic, respiratory irratant, etc.) The wikipedia article for glyphosate has numerous citations to back that up. It is not always the glyphosate itself that causes the problems but the surfactants and other “inactive” ingredients that are used in conjunction with the glyphosate, unfortunately the studies generally focus only on glyphosate and not the other ingredients that are used with it. One of the most famous studies by Williams, Munro, et al. is highly criticized since Munro’s company Cantox Health Sciences is known for whitewashing the toxic effects of Agent Orange, another Monsanto product. (Dominion 2007). I *Totally* agree with you! Thank you for your post. More folks need to do similar homework to see just how dark their practices can be. Maybe this is why there is so much cancer, throughout all living things. Mankind is destroying the Earth. Good luck to all mankind. If thats the case why is it banned all over the world ?its a proven cancer causing ageant.!!!! Many countries do ban roundup, not the USA however. And, finally, I’ve heard making a paste out of vinegar and salt is equivalent to the type of roundup you’d bruch on stumps, but I haven’t tried that yet. It seems odd to bring up Round Up in a post talking about Organic Weed Control. Even if Round Up was relatively safe, when you purchase Round Up you are supporting Monsanto, a company which is doing everything in its power to destroy natural gardening by developing genetically modified seeds that can’t reproduce and suing organic farmers when the genetically modified seeds blow onto their property. Monica, what fantastic tips and insights. I really appreciate your input. I too have heard from reputable sources that Roundup (or at least the active ingredient in some of their simpler products, glyphosate) breaks down quickly in the soil. There are two things that worry me about Roundup. One is that they have a lot of products besides the simple glyphosate-only spray, and some of them contain chemicals like diquat that I really don’t feel comfortable with. So people could think that Roundup is safe because glyphosate is reasonably safe, but not realize what other chemicals they are getting into under that Roundup label. The other is that there is concern that the “inert” ingredients in plain old glyphosate-only Roundup, which are meant to help glyphosate work more effectively on the plants, may actually increase the danger to humans who are exposed to it. So while I’d tentatively agree that spraying normal-old glyphosate-only Roundup isn’t a big deal – I also have enough hesitation about it that lately I’ve been wanting to really explore the alternatives. I love your tip about using a sponge applicator for Roundup. I love that idea. Anything that reduces the spray drifting about makes it that much safer to use. Thanks too for the great tip about vinegar and salt on stumps. If you do get a soil knife, I’d so, so recommend the stainless steel one rather than the carbon steel one. The stainless is so much sharper, stays rust-free, and is lighter-weight, which is better on the wrists. Anyway, thanks for stopping by, Monica! As always, what a great contribution. Hi Genevieve, thanks for the round up of week removal techniques. Sorry. I have the old heavy hori hori, it is my go to tool for everything that can be done by a hand tool. I pull my weeds by hand, hopefully before they set seed. As the plants have filled in the week problem has lessened. Intensive close together planting really makes weeds struggle, they get no light. I will check the bottle ingredients on the round up. I do use that on the paving where the weeds cannot be pulled. We have weeds and desirable plants growing where the curbing meets the street. Just goes to show the power of seeds. Weeding by hand is what came to mind when I read the title of your post. It doesn’t get much more organic or natural than that. 😛 Still, I’m going to have to try vinegar or something drastic on the blackberry brambles trying to take over the ground over my septic system. I lopped them back over the winter, but even with a pickaxe and shovel I couldn’t get the root systems on the big ones out. Luckily, with container gardening, there aren’t very many weeds. I just pull out the ones that do have the gall to grow in my pots. It’s much easier than pulling weeds in the ground as the potting soil in containers is much less compacted than garden soil can be. So nice to have stumbled upon your site, both lovely and informative. Though I was hoping for a weeding solution that included clicking your heels and saying Weeds-be-gone! So far no luck when I follow that protocol, but I’ll be working on it; I just need to find the right magic word. Thanks! In regard to the blow torch implements that you hook up to a propane canister, I have one and it’s really good for one thing: roasting marshmallows or crusting over the world’s largest serving of creme brulee. Don’t waste a dime on those. They actually refresh dandelions; allowing them to resprout healthier and happier than ever. Please reconsider your dandelions – the roots of the dandelion are the most beneficial liver cleanser known to mankind – IF ORGANIC. Dandelion roots will grown down a few inches, and the take a sharp turn to the (in California), left. Dig as much as you can of the root, wash it, dry it slowly in a low temo. oven – and you have a natural liver cleanser. (Look it up yourself). One note of caution – milk weed and dandelion can look the same – IF YOU PICK A LEAF AND IT MILKS – DO NOT USE IT – IT IS MILK WEED WHICH IS POISONOUS. No milk – it is a dandelion. Please do your homework first. It is a very beneficial medicinal herb. Embrace it. Deborah, point well-taken and I agree! And thank you for your tips about dandelions as a liver cleanser, which I am very impressed by! However, there are some places where people wouldn’t eat a dandelion, such as in a front yard where dogs may roam – in those cases, it can be nice to know how to have a more traditional-looking front lawn free of broad-leaf plants. Renate’s last blog post..Hey Google, what’s with the ads? Yeah I will take the environment friendly path any day. Chemical Weed Killer’s only harm the environment! We had a whole slope covered with weeds. We covered the area with flattened cardboard shipping boxes, covered the cartons with woodchips, and the weeds are GONE! And, the cardboard and chips are creating richer soil. Recycling, composting, and organic weed control all in one! What a fantastic idea! I bought a house with a flower bed that is out of control. I dont want to till it as there are some beautiful well established plants I dont want to mess with. Will try this!! I used boiling water to remove a very large decorative grass that was larger than my porch. it took three boiling teapots but worked great. Sounds like my gardener (all organic, no pesticides) who used a blow torch to kill a patch of clover in the middle of the lawn. Took about 4 times over a month to get it all, down to the roots, but it hasn’t been back. Kinda scary, but he did it during the wet season and with a hose nearby! Shirley, I really wish I knew, but I don’t know that anyone could say that with complete certainty. How fast roundup breaks down has to do, I think, with temperature, how much moisture, etc. This is why I go organic whenever possible. To speed the process, I’d remove the dead weeds that are there and wash the area with water a few times to try to get the residue off. Maybe your local agriculture extension office would be able to give you some scientific literature on it and interpret that literature for your area? Round-up is not only a chemical poison that is quite dangerous to your health and the health of the environment, it is a product of Monsanto, a monster chemical corporation determined to eliminate the smaller “natural” farmers and own every seed on the planet. Avoid Monsanto products at all costs. I been thinking about spring lately and gardening. I have a good sized vegetable garden but get an enormous amount of weeds, I do not feel comfortable using round up or any other chemical, as I have small children that like to be in the garden. Any suggestions anybody?? Janyn, try Weed Pharm. Very safe for veg gardens. I WILL NEVER, NOT EVER use Roundup EVER again! Two years ago I tried using it on my flower bed because the instructions stated “COMPLETELY SAFE TO USE AROUND AND IN EXISTING PLANT and FLOWER BEDS”, well that WAS AN OUTRIGHT LIE, I followed the instructions thinking it would be 100% perfectly safe around all my Roses, Marigolds, Dianthus, Impatiens and a few other flowers I don’t recall, well RoundUp did it’s job all right, but it DESTROYED and KILLED EVERY SINGLE FLOWER in my “Pond/Prayer Garden”. Over $500.00 worth of flowers ruined thanks to their LYING INSTRUCTIONS on the bottle stating “COMPLETELY SAFE TO USE IN FLOWER BEDS. If I could have sued RoundUp for my plant/flower loss I probably would have. Now I FLAT REFUSE to use anything in my plant/flower beds other than back breaking hand pulling of the weeds. I hate weeding as much as the next person, but until SOMEONE makes a COMPLETELY SAFE ORGANIC WEED KILLER that isn’t going to wipe out my entire landscape or be hazardous in any way. shape or form, it’ll be hand weeding only for me. We can put men on the moon, make pacemakers to help patients with heart problems and do all kinds of other miraculous things, but we have yet to master removing ourselves of all these dadburn weeds! Does make on wonder doesn’t it? Clay, It is safe to use anyplace. Just don’t get it on anything you don’t want dead. If you can’t follow the directions, you should not use the product. As simple as that. People like you are more of the problem than the chemical company! I’ve been certified for chemical use for over half of my life and you need to comprehend before using a chemical. They did not lie! You just did not follow directions! Here’s some advice. Quit crying about what hasn’t been done and do it yourself. Like go back to school and invent it. Mali, I’d call out a garden coach, consultant, or contractor and ask for their advice. There are so man solutions that it’s hard to say what’d be best for you without being at your site and hearing in great detail of your plans for it. Moving soil around with a bobcat often kills mown weeds. Rototilling too. Sod-cutters will remove mown weeds and you can compost them on site then re-use the good soil. Bringing in foreign topsoil isn’t always a good idea but can kill mown weeds if you put 1′ of soil on top of them. 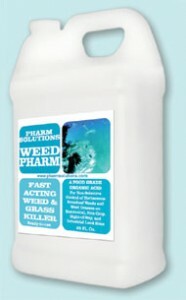 WeedPharm spray (you can buy large bottle in my online gardening shop). In every case, you’ll want to put down some variant of landscape fabric/ newspaper/ heavy mulch/ new plants once you’ve got them out because once you churn the soil, more weeds are coming. Just focus on clearing up one area at a time and keep everything else from reseeding by mowing often. Hope that’s helpful!! Old carpet is free. Lay it on top for a few months. The longer the better. Carpet is heavy when wet light when dry. Haul it away when the weeds are gone. Or leave it there for a weed block. What is the name of the weed you have as the picture with this article? I use a half-gallon or gallon milk jug with the top cut a little wider and the bottom removed to direct the spray from the garden sprayer right where I want it and limit over spray. that way I can use the handle to carry it around and not worry about touching the spray from the inside. I prefer to use the half-gallon and then carry it around the yard in a gallon size container so nothing drips from the inside around the yard as I’m walking with it. I had dead spots on the leaves of some plants where it dribbled off the container I used one year. I can not imagine someone on an organic garden site suggesting that anyone use Roundup. There is clear evidence now that it is still present in soil after THREE years, in my opinion that is not a quick break down. It also kills the microbes in your soil. Please read the info below! According to Robert Kremer, a microbiologist with the U.S. Department of Agriculture’s Agricultural Research Service, glyphosate changes soil composition and disrupts the normal balance of microorganisms in the soil, leading to an increase in fungal growth and harmful bacteria. Right on Sean. Thanks for letting people know. Also Monsanto was sued for mislabeling Round Up. They labeled it as Biodigradable and were sued twice for it. Now they don’t have that on their new containers, but people still think it is safe. It is also if I am not mistaken themaoist widely used chemical in the world. Which is very sad. I wouldn’t trust anything that company makes. They are only looking to make money and it doesn’t matter who they hurt along the way. I like to use the example of the cigarette companies and how they tried to tell everyone smoking was safe. This is the same thing with Monsanto. They know their products are harmful, but they won’t admit it. Very sad. Do some research everyone and make a healthy decision. Clover is essential for your lawn, because it takes nitrogen from the air and places it under ground to “feed” your lawn. Before scientists invented broadleaf killers in the 1950s, clover was actually part of the lawn seeding mix you would spread. Many environmental-conscious gardeners recommend that you mix in 5% clover seed in your lawn seed to prevent the need for manual (or, *gasp* chemical) application of nitrogen. Round up is not organic weed control. I agree that Glyphosate does not stick around too long but if you read label, then 99% of the contents are called Surfactants. Surfactants help Glyphosate stick around longer. which is why it works. There have been studies where Glyphosate was reported to cause genetic abnormalities in tadpoles in the ponds nearby where Glyphosate was used along with surfactants. Please educate yourself completely before using a product. people can say anything they want! We have yellow ground cover sedum coming up all through our lawn. How can we get rid of it without killing the grass? I discuss this kind of thing in depth in my ebook, but a few quick suggestions – mow kind of low (1.5″), rake sedum out vigorously and thoroughly with a sturdy metal rake (the Garden Shark rake works well), then topdress with 1/2 inch compost and begin mowing lawn in future on a taller setting, preferably 3″. Try Ortho EcoSense organic lawn weed killer which is made of iron (available in US and Canada except California) and try that on any stragglers. And get your lawn healthy and thick enough to out-compete the sedum in future. I wrote about 15 pages covering this type of situation in my ebook, so this is just a few quick thoughts. I hope it’s helpful! Weeds in lawns can be very tough. I know it’s a chemical, but does Formaldehyde kill weeds? When Coke (as in Coca-Cola) heats up, a chemical reaction occurs with the artificial flavors and sweeteners in it and they turn into Formaldehyde, and that’s a cheap, quick solution if it works to kill weeds. I’m just going to use it on driveway cracks, but I don’t want to waste some good, tasty Coke if it doesn’t work. Thanks! Has anyone heard of throwing down table sugar for weed control? I’ve read only one article so far about it. The theory is sugar will feed the micro-organisms,thus enrich the soil. Weeds do not favor this environment. Any thoughts? In our vegetable gardens, we use thick layers of straw. You still have to pull the occasional weed, but it isn’t terrible. Grow a cover crop in fall (buckwheat, clover, etc). It adds nutrients back into the soil and keeps most weeds from taking seed. In the spring, till it all under and start over. I used to use weedcloth and the straw method works so much better. Plus, it is more aesthetically pleasing. I am definately going to try the vinegar for some areas that are infested with johnson grass. Thank you for the great topic. I’m trying to stay ahead of a couple acres of weeds in an orchard that has morning glory or bindweed. I tried the vinegar / salt / soap which did very little. Roundup works really well, but I want to move away from that. I’m looking for other options since mowers and discs are not sufficient. Be careful with that salt mixture on cement. Salt will make cement crumble. Oh my goodness everyone who use deadly roundup etc should be ashamed of themselves. For my veggie garden I use Lucerne for nitrogen and straw to keep the weeds at bay which works fantastic and when the beds lay to rest I will cover them with a layer of straw so come spring the weeds will be minimal. I am going to try the vinegar salt recipe and also I save all my cardboard , newspapers for weed control. If you keep on top of your maintenance there should never be a need to use NASTY, HARMFUL CHEMICALS!!! If the contents/ingredients say it contains anything other than water then you should investigate. Hi! what do you do after torching the weeds, pls? They’re dead, but they’re still standing. We’re trying to help the dogs with the fox tails. Right now, it looks like we’ll still have to cut them down. It looks like a field of hay…thanks! I usually only torch baby weeds, which shrivel and disappear quickly. Sorry I can’t be more helpful. Fox tails. Cover with old carpet or pull up roots when soil is damp- only thing that worked for us. I like the cardboard boxes idea for weed control (under wood chips) but doesn’t the water just run off the cardboard? I’d like to use this under some trees. I have been using cardboard and woodchips for years to start beds. It works great. The cardboard will absorb the water and eventually break down, but you need to make sure you do not walk over it because it is slippery at first. It takes about 3 months for it to breakdown, but I usually do it six months before I intend to plant. For added benefit I put a layer of compost under the cardboard for a new bed. Once the cardboard breaks down it is ready for planting. Also have used it under existing trees to kill the weeds. We tried one tree with landscape fabric and one with cardboard. The cardboard actually worked better. Go figure. Wow! That’s awesome to hear Terrie. I have many gardens and most are planted with perennials. I have a neighbor who has a large field that he refers to as a “wildlife area”. This is in a residential area. He does not mow and considers the weeds as prairie grasses! I’m having a hard time pulling all the weeds out of my gardens. My question: Are the tall neighboring weeds having this effect on my gardens? Most of the weeds are the type (?) that have a top that when it’s windy the weed seeds are released. If this is the problem I may have no other choice than to take out my gardens and gardening being my hobby this would be devastating. I have removed weed roots along the house foundation about 6 inches below grade and am working my back towards the bed edge/gravel drive. Some of the weeds are growing back (probably from connected the connected root system) Is digging this deep effective/necessary/futile? I am going to treat with vinegar/soap/salt mixture -Other than one rhododendrum tree, there is nothing but top soil (which has same weed starting to sprout) ANY SUGGESTIONS? ooops, my recent post had some editing gaffs..and some typos …. Is there an organic product that will eliminate broadleaf plantain? Is there a natural way to stop mice from wrecking the lawn in winter under the cover of snow? and explaining everyhing on the topic of that. Years ago a college botany professor advocated “over-supplying” Borax to kill grass in driveway cracks. Plants do need trace amounts of boron to grow, too much will kill them. Any chance that might work on blackberries? This is an unused side yard area, perhaps 20 ft by 6 ft, sloped, on the blind side of the house. Same prof said a heavy application of ammonium sulfate fertilizer under crabapple trees at the right time could make the baby crabapples fall off leaving a cleaner bed area. Would that work on blackberries? I’ve used apple cider vinegar, unprocessed, salt and dishwashing liquid. If you make it strong enough it’s quite effective but needs repeat applications. I’ve used shredded newspaper around plants and under the mulch to eliminate weeds. The paper is biodegradable, plus it holds moisture to lessen the need for watering as often. Or if only I could get the dang “creeping Charlie” to disappear! Rock salt does it all! If you need a full kill zone, like a gravel path or between stones in a walkway, just lay in the salt. It took about half a dozen bags, but it finally stopped shoots coming off a stubborn locust tree that had been blown over and stump ground. It lays in real nice if you use a board as a straight edge. It makes a clean line (like along fences) because it doesn’t blow around and melts in the rain pretty much straight down in place (unless there is a slope, then the kill tends to bleed, but can be controlled by cutting a mini trench). As a bonus, it acts as an effective slug and snail barrier. Best of all, it is cheap and organic! My flower beds are thickly covered with mulch so not much weeding to do their. It’s just my lawn that requires the most maintenance. It’ll pay off though in the long run. Have you considered using a drift free weed control? Try Smucker MFG products. They offer a variety of drift free weed control products that apply chemical directly onto the weeds. Great way to use less organic vinegar while still taking care of your weeds in a more timely fashion than hand pulling. I always hand weed in my garden. Weed torches, boiling water and salt will harm insects and snails etc.. as well as micro-organisms, so I think their use should be discouraged. I did not know that ‘Roundup’ broke down so quickly. Good news if true, as everyone seems to use it.